Click on the images below for a specification sheet in PDF format. With it's strengthend frame and special pump, the M30 allows handling pallet loads up to 3 tonnes. Stainless Steel trucks are designed for corrosive environments, together with the food and pharmaceutical industries where high standards of hygiene are required. 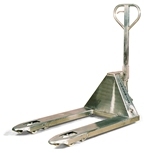 A galvanised version is also available for non - food applications. Reel/Paper Roll/Drum Truck; for handling cylindrical loads where the lifting operation is achieved without pallets. Cylindrical loads can be lifted directly from the floor, transported, and deposited in their unpalletized state. Low Profile, with it's 55mm lowered height this type of pallet truck was originally designed to handle tin plate packs. Now in great demand for container stuffed load handling. High Lift Pallet Truck: Manual pallet trucks aid loading and unloading pallets at a convenient height thus avoiding back injury. High Lift Pallet Truck: Electric lift pallet trucks aid loading and unloading pallets at a convenient height thus avoiding back injury. The electric version features a 12 volt, 54 ampere/hour battery with separate external charger. 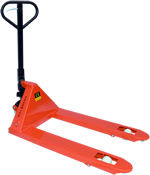 Brake Pallet Trucks: CMH Ltd can supply a wide variety of brake equipped pallet trucks. Standard service brake with parking position - pull on to stop. Foot brake - simple foot operated parking brake. Reverse action brake, with a sensitive, ultra light, pull off action. The brake is automatically applied when the operator releases or relaxes grip on the lever. Click on the image to view our page dedicated to this specially developed pump truck. Weigh Scale Pallet Truck: Several versions of our mobile weighing station are available, ranging from the basic check weight read out, metric imperial. To all purpose print out report with user address, telephone, e-mail company logo etc. Variations include automatic tare calculator, counting, comparator, profile plus weights and measures approved standard.